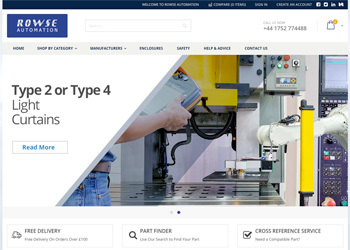 To find parts, simply enter the part Number above and our system will find the products you require. ABB was founded in 1883 as the General Swedish Electrical Limited Company (in Swedish ? ASEA). About 100 years later this company merged with a Swiss electrical group founded in 1891 (BBC). ABB is now a Swedish-Swiss multinational corporation, shipping over a million products to global customers every day. It has corporate headquarters in Zurich and there are four main production divisions: Electrification Products; Power Grids; Robotics and Motion; and Industrial Automation. ABB operates in over 100 countries and has about 147,000 international employees. There are around 20 sites of ABB operations in the UK, with approximately 3,000 employees, and a headquarters in Warrington, Cheshire. ABB's innovative power and automation solutions provided to UK customers are valued at around £1bn of their annual revenue. The ABB corporation is a technological pioneer whose history of innovation stretches back more than 130 years. In the 21st century, the company is approaching the industrially digitalised future with two stated value propositions: to automate industries entirely from natural resources to the finished product; and to bring electricity to any plug from any power plant. Their declared Code of Conduct for business principles embraces respect, responsibility and determination, and they are committed to global integrity and sustainability. ABB is one of the world's leading manufacturers, and Rowse is pleased to stock many ABB safety products, including Emergency Stop buttons and Switches. ABB Safety Light Curtains are available in many configurations to suit every application, with a wide range of mounting accessories and other options that include deviating mirrors, lens shields, rotating brackets, and protective stands and tubes. ABB Safety Relays are offered in many versions, varying from simple, basic models, to more powerful and complex types for advanced systems, such as those used in gates, hatches and interlocking doors, as well as emergency stop and output expansion features. A range of ABB Safety Controllers is available for both smaller and more complex systems, with advanced PLCs offering communication interfaces and system integration. Software-based Safety Controllers are far more flexible and can easily be expanded, modified and reproduced. We stock an extensive range of ABB contactors for a wide range of applications, from the very modest to the industrial scale, with a broad selection of input voltages and AC or DC current. ABB Overload Relays are available in both Solid State and Thermal options, and can also protect against short circuits in any connecting cables, internal motor faults or damage in the coil. MPCBs are supplied in a huge range of different sizes, allowing maximum flexibility in installation. We can supply ABB parts in various connection options, including screw-in type, spring-loaded or ring cable lug.